The 8" Curved Flipper is a step up from the entry level shears but is still very affordable. A grooming shear with high carbon stainless steel and a true convex edge - this thing is sharp!! The even handles are really nice when you are all contorted and just need to make one tiny correction with your left hand. It's may not be common, but it can come in handy! 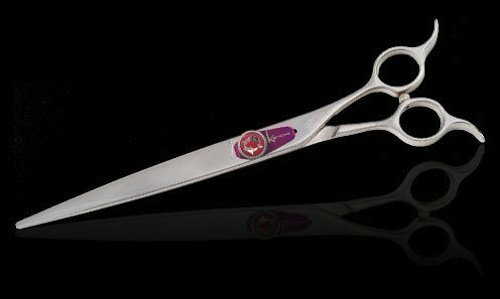 The deep pink tension assembly is gorgeous and makes it a snap to make minor or major adjustments to the tightness of the shear. If you have any questions about this product by Kenchii Grooming, contact us by completing and submitting the form below. If you are looking for a specif part number, please include it with your message.